"All Along the Watchtower" is a song written and recorded by the American singer-songwriter Bob Dylan. The song initially appeared on his 1967 album John Wesley Harding, and it has been included on most of Dylan's subsequent greatest hits compilations. Over the past 35 years, he has performed it in concert more than any of his other songs. Different versions appear on four of Dylan's live albums. Electric Ladyland is the third and final album of new material by the Jimi Hendrix Experience, released in October 1968 on Reprise Records. 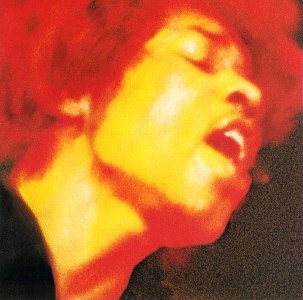 It is the only Hendrix studio album professionally produced under his supervision. It topped the Billboard 200 album chart for two weeks in November 1968. The Jimi Hendrix Experience was an English-American psychedelic rock band that formed in London in October 1966. Comprising eponymous singer-songwriter and guitarist Jimi Hendrix, bassist and backing vocalist Noel Redding and drummer Mitch Mitchell, the band was active until June 1969, in which time the group released three successful studio albums. After Redding left the band, Hendrix and Mitchell stayed together through other projects. The Experience 'reunited' in 1970 with Billy Cox dubbed "The Cry of Love", until Hendrix's death in September 1970. Redding died in 2003, and Mitchell became the last original member of the band to die, in November 2008. One of my all-time fav rock songs! When I was in college, majoring in English, I took a Comparative Lit class (elective, yay!) on Bob Dylan. An entire semester listening to and analyzing Dylan's songs. My parents weren't amused, but the info stuck with me.